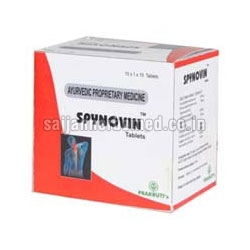 We are stocked up with Spynovin Tablets that are effective in treating Cervical Spondylosis and Lumbar Spondylosis, Osteo-orthrosis and Sciatica. Our Spynovin Tablets are sourced from the leading manufacturers who are acclaimed pan India for their quality and high effective medicines. These tablets help in rejuvenating the bone cells. They also rectify the stiffness of the neck and back and help in preventing nerve dysfunction like weakness of the limbs or arms, numbness etc. Our Spynovin Tablets act as a calcium supplement and prevent the complications like loss of muscle function, poor balance, permanent disability etc.